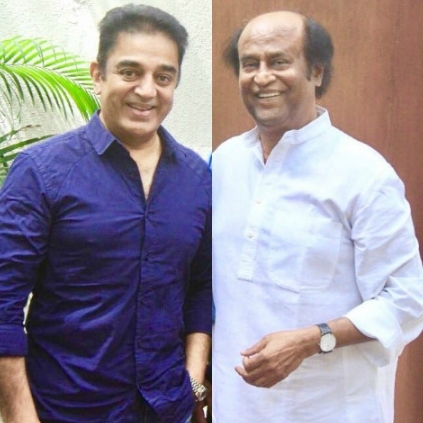 Why did Rajini and Kamal meet recently? Recently the internet was abuzz with the picture of Rajini and Kamal with Thoongavanam director Rajesh M Selva in the middle. There were widespread speculations as to why the duo met. Sources close to the actors reveal that it is something normal and the friends meet on and off to catch up with things. While Rajinikanth is in the process of wrapping up Shankar’s 2.0 and beginning Ranjith’s next, sources aver that Ulaganayagan Kamal will be commencing his next schedule of Sabash Naidu by the middle of December. Right now, the preparation for this schedule is reportedly happening. It has to be recalled that the unit of Sabash Naidu finished a schedule in USA some months ago. The film features Kamal, Shruti Haasan, Sourabh Shukla, Brammandam and others. Hot: GVP, Rajiv Menon and AR Rahman get an apt and catchy title! What next from Pichaikaaran director? Will it be a Valentine's Day gift? People looking for online information on Kamal Haasan, Rajinikanth, Sabash Naidu will find this news story useful.